Our stuffing contains no carrots or breadcrumbs . Stuffing is not just for turkey anymore. 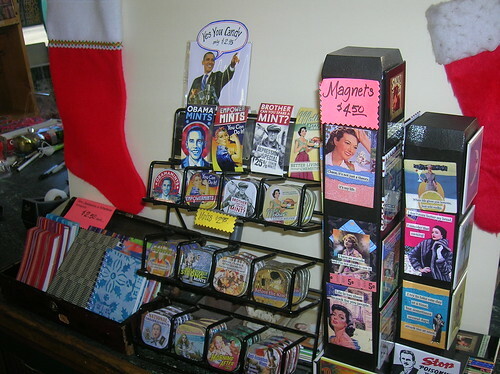 You also have to stuff the stockings of tour friends and family members with small, inexpensive but interesting items like the ones you can find at Capitol Hill Books. We understand that it’s hard to fit a book like the “Collins’ Atlas of Archeology” in a small cotton sock, but a quippish magnet, some awesome notepads or a tin of Obama mints can easily fit in almost any type of foot covering. Sometimes your own words are the best way to express your appreciation for a loved one. 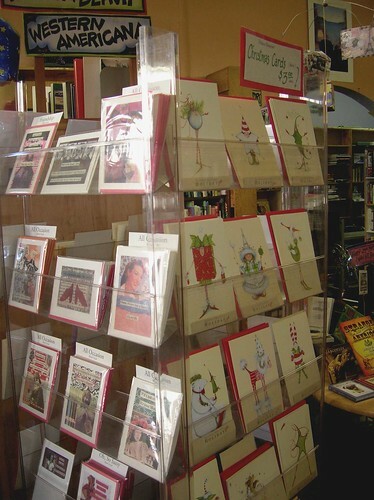 We have both blank cards and cards with messages in them to intrigue and inspire. All of them come with envelopes and have interesting designs that are a lot different than the typical cards found at drug stores. Be a thoughtful gift giver by making someone a glad recipient of a Capitol Hill Books' gift certificate. Though it’s easy to spend hours browsing in Capitol Hill Books for the perfect holiday gift, we understand if you can’t remember if your sister likes Edward Abbey or Edwin Abbott. Let your loved ones make their own choices by giving them a spectacular gift certificate for their favorite used book store. You can make out gift certificates for any amount and your loved ones can use it to buy anything in the store including books, cards, magnets or whatever they want (well maybe not our bookshelves). 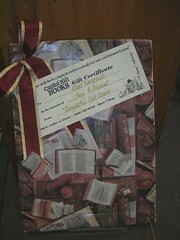 And since our books are usually inexpensive, gift certificates go much further here than they would at a new bookstore. So forget the long-lines at the mall and come to Capitol Hill Books for all your holiday shopping. Not only do we have books for almost every interest, but we also have those small items perfect for the office gift exchange or filling up your favorite argyle. This entry was posted in Uncategorized and tagged gift certificates, gifts, Holidays, stocking stuffers. Bookmark the permalink.